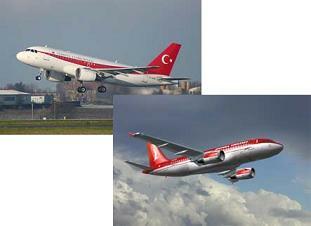 The Airbus Corporate Jetliner, also known as A319CJ, is a long range commercial jet development of the A319 airliner. It directly competes with the Boeing Business Jet and devoted long range business jets such as the Bombardier Global Express and Gulfstream V.
It was launched in Paris Airshow on 1997. Flight crew of two. Six standard layouts offering seating from 10 to 39 passengers. Wing span 33.91m (111ft 3in), length 33.80m (110ft 11in), height 11.80m (38ft 8.5in). Wing area 122.4m2 (1317.5sq ft). Two 118kN (26,500lb) International Aero Engines IAE V2527M-A5 or CFM International CFM56 turbofans.